Welcome to this charming Belleair Beach bungalow originally built in 1948! From the moment you drive up you are greeted by the large corner lot and the mature tropical landscaping. Spacious 2 car garage carport and room for your motor coach or boat you will never be short of space for your toys! Once inside you are greeted by original hardwood floors and stacked stone fireplace for those âchillyâ Florida nights. Spacious dining area and updated granite kitchen look out onto the eye-catching backyard. An adjoining sunken family room is great for a more casual space! Two generous BRs are along the hall as you head to the large en suite master! The Piece de Resistance awaits you out the back door! Large salt water heated pool is just one phenomenal feature! The pool was recently refinished w/ travertine pavers installed on the surrounding patio. To the right you will find a large pergola with space to lounge and soak up the sun or enjoy a lovely al fresco meal. To the left lies a large grassy area and a lovely outdoor shower for rinsing off after a trip to the beach! 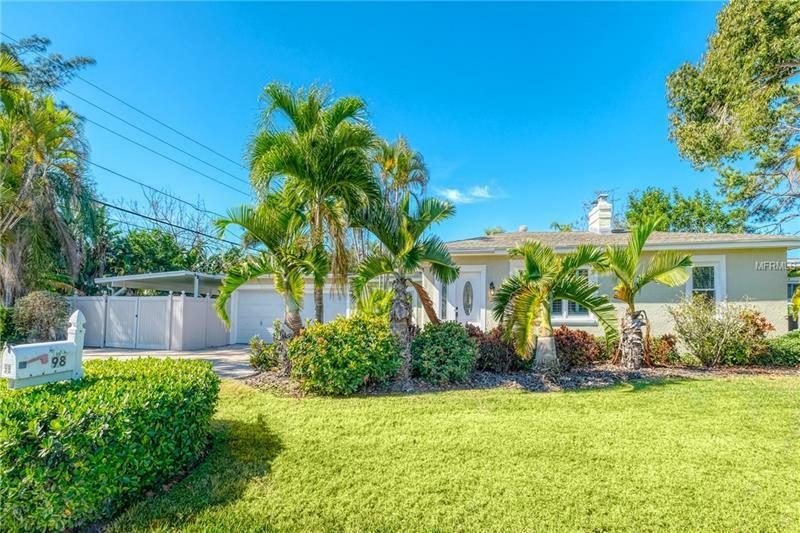 Another great feature of this spectacular backyard is the private locked gate leading to the Indian Rocks Beach playground and walking access straight to the beach! Just minutes to shopping restaurants and everything else this beachside community has to offer. With 1900 square feet under roof large .39 acre lot this home has everything your looking for in a primary residence or wknd getaway! You surely donât want to miss!